When I get the opportunity to work on a big budget production, one of my favorite things is having access to gear that I could not otherwise afford to play with on my own. Unfortunately, borrowing an Alexa and a few Master Primes from production over the weekend to shoot my favorite local band or try out some new shot ideas is sort of out of the question. So instead I’m constantly trying to come up with ways to shoot high production value footage on a low budget. There are several compact, powerful cameras to choose from that don’t cost a fortune and paired with the right lenses, these cameras can produce some very impressive images. On paper, one camera stood out above the rest, boasting some amazing features at a very attractive price (currently under $3,000): the Blackmagic Design Production Camera 4K, which I will refer to as the BM4K for the rest of this article. Being the skeptic I am, I decided to put the BM4K to the test to see just how well it delivers on those impressive specs. Over a period of two weeks, with the help of my good friends Erin and Collin Joseph Neal from Faith vs. Fate Productions and many other talented individuals, we put together nine short vignettes, each shot in a unique environment to test various capabilities of the camera. I’m going to break down each of these vignettes and discuss for each one what we were testing and how well it performed. I will then wrap up this article with a summary of my findings about this camera that will hopefully help you make an informed decision about whether the camera is right for you and how you might get the best performance out of it if you do decide to shoot on it. DESCRIPTION: Hands-down the best motorized gimbal stabilizer on the market. 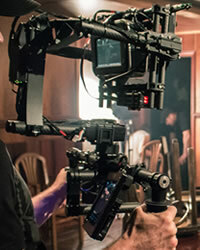 There are other less expensive similar products on the market, but none perform at the level of the MōVI. I used the M15 for these shoots because I own one for my work with larger cameras, but the far less expensive (appx. $4,000) MōVI M5 will also carry the BM4K camera and perform just as well, it’s just a bit smaller than the M15 which actually makes it much easier to handle in most situations. So unless you plan to carry larger cameras such as the Sony F55 or a fully loaded RED Dragon, go for the M5 and save some cash to buy some nicer lenses! DESCRIPTION: On most big shoots, this item is a must-have. For these small crew shoots, I actually only used it for the shots we did out of the back of a pick-up truck while chasing horses at a distance. We probably could have done these shots in majestic mode / single operator as well, but the controller makes it much easier to frame your shots more accurately, which is especially important when you’re doing shots that take a long time to set up and you can only do once or twice, such as chasing horses up a hill. I happen to already have a MōVI Controller so we put it to use, but if I was on a tight budget, I could have gotten through these shoots without it. One advantage of having this on a small crew shoot is that with the Follow Focus Upgrade Kit, you can pull focus directly from the controller which is a pretty nice option that we used a few times on these shoots. DESCRIPTION: The MicroRemote by Redrock Micro is one of the most affordable lens control systems on the market today that does not compromise quality for low cost. 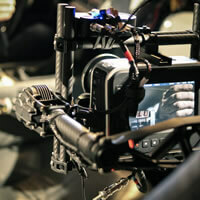 They also offer a finger wheel accessory which allows the MōVI Operator to pull their own focus. I can say with complete certainty that if you are pulling your own focus while operating the MōVI in majestic mode (single operator mode), you will miss your focus a lot, but with a little practice and muscle memory, you can get reasonably good at it and pull it off. Out of the 9 shoots we did on this project, I pulled my own focus on 6 of them and we got pretty good results. There were several great shots that got scrapped in editing though because of bad focus, so you sort of just have to accept that will happen if you do plan to pull your own focus. The upside of course is that it’s one less crew member you need on set which on a low budget shoot, can be a pretty big cost savings. 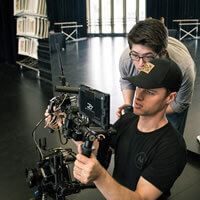 DESCRIPTION: There is a huge caveat to pulling your own focus as a MōVI Operator – to have a fighting chance of being in focus, you need to have a large, sharp, accurate monitor to see what is happening on the camera. You might be able to do this on a smaller monitor, but a 7 inch monitor is definitely a huge advantage, as well as having a monitor that offers focus assist tools, such as focus sharpening and peaking. SmallHD also makes the AC7 monitor which is much less expensive at $599, but it does not have all the exposure tools the DP7 offers. This is something I’ll dig into a bit later, but one of the shortcomings of the BM4K camera is its lack of exposure tools. It does offer zebra striping and a simple histogram, but quite honestly, these are very rudimentary tools that will only get you in the ballpark of proper exposure. To really get a solid picture of what is happening with your exposure, you need waveform, vectorscope, and false color tools and the DP7 offers all of these, plus many more. The AC7 does offer a false color function which could be enough to get you decent exposure for your shoot if you cannot afford the more expensive DP7, but it is definitely nice having the other tools if you can afford it. 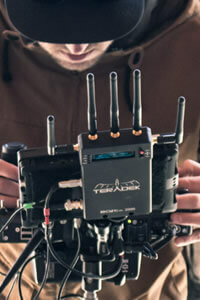 DESCRIPTION: On every professional shoot I go on, the Teradek Bolt Pro 2000 is absolutely essential to my MōVI system. It is the most powerful, most reliable system on the market and I absolutely love it. On these shoots however, we only used the system on the 3 shoots where we had a dedicated focus puller, and in these instances, I think the much less expensive Bolt Pro system would have gotten the job done. So if you are planning on pulling your own focus and can do without your director seeing live picture on a monitor, you can save yourself a bunch of money and go without. But I would not at all recommend you ever go on a professional MōVI Operator shoot without the very best wireless video system you can afford. It’s a key piece of gear and I cannot stress this enough – if you can’t get a solid wireless picture to your client on any given professional shoot you go on, your shoot will probably turn into a disaster. Enough said. 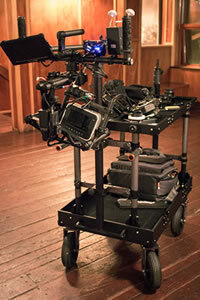 DESCRIPTION: Having a cart on a low budget set is a complete nice-to-have. You can absolutely get away with simply using the MōVI stand that came with your MōVI, or a c-stand or even a light stand, or pretty much anything with a baby pin sticking out of it. 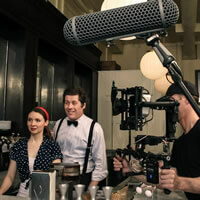 But if you can afford it, having a nice camera cart makes everything on set easier – rigging your system, docking your MōVI, moving your gear around, keeping all your nuts and bolts from getting lost all over the ground, stashing your snacks and water bottles, basically creating a nice little portable home away from home on set. Inovativ carts aren’t the cheapest carts around, but they are amazingly lightweight and portable, while still being fully functional carts. And if you are going on a professional shoot, you do not want to be the only guy on camera crew without a cart. DESCRIPTION: Assuming you are exposing your shots correctly, the look of your shots comes from 1 part camera sensor and 3 parts your lenses (maybe even more heavily weighed on your lenses – this would be an interesting DP debate!). The difference between the look you will get from that $250 Canon kit lens and a $500 refurbished Leica 50mm 2.0 Summicron is astronomical! 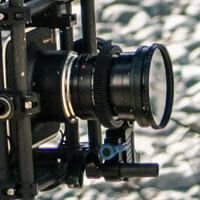 Do not be swayed by low cost lens companies that add the word “cinema” to their products – it does not mean they will actually give you a cinema look, it typically means that a) the focus ring is enlarged to allow for easier critical focus pulling, b) the focus ring has gear pitches for focus pulling equipment, c) the glass breathes less (on nicer cinema lenses) for smoother focus transitions, d) and lens kit-wide the filter ring diameters and weight of the lenses are more uniform for more modular use. But all of these benefits have absolutely nothing to do with the actual quality of look of the lens. Of course, the “look” of a lens is entirely subjective and your needs will change depending on the subject matter you’re shooting, etc. – this topic is HUGE! But to simplify this meaty topic, I will generalize by saying that it is extremely unusual for new, inexpensive glass to have a real quality cinematic look. Companies such as Tokina and Rokinon do offer some very compelling products on paper with very attractive price tags. But in practice, I have never seen these low cost lenses hold their weight against professional glass – not even close. So my strong recommendation is to buy old glass that used to be the best in class back in the day. Buy Leica R or Zeiss Contax glass on eBay or KEH.com, buy EF mounts from Leitax.com, get some custom 3D printed focus ring gears from followfocusgears.com, buy some step-up filter rings from www.bhphotovideo.com, and shoot some very high end looking footage for a very relatively low cost. I built my entire kit of Leica R lenses (19mm 2.8, 24mm 2.8, 35mm 2.0, 50mm 2.0, 60mm macro 2.8, 90mm 2.0, 135mm 2.8) for about $6,000. 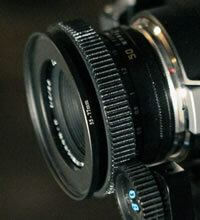 These lenses show up on professional feature film shoots all the time, they are not just for low budget shooters. If you only have a little money to spend on lenses, buy the Leica R 24mm 2.8, 50mm 2.0, and 90mm 2.0. These will get the job done 90% of the time and will raise your production value through the roof! It’s under $3,000, it has a super 35mm sensor, it has a global shutter, it shoots ProResHQ 4K or RAW directly to SSD disks, it comes with Resolve software, it has 12 stops of dynamic range – sounds too good to be true, right? The surprising answer is that it actually delivers very well on its promises, with only a few issues. Depending on who and what you’re shooting for, these issues may be only minor inconveniences or could be deal breakers. Let’s look at the “off-the-spec sheet” pros and cons of the camera and then we’ll look at the true test of the camera – the actual footage we shot on it. • Compact and lightweight design is perfect for gimbals – pretty straightforward rigging and setup, with a few exceptions I’ll discuss in the next section. • The camera sensor truly captures a film-like quality image. DSLR cameras like the Canon 5DMKIII do a great job of shooting video that looks like moving photographs, but it has a particular look that is very easily distinguishable as “the DSLR look”. The BM4K does not suffer from this – it really looks like cinema film stock if you use quality glass and expose the shot correctly, with very little color grading needed. The only other sensors that I have seen with this quality look with little post corrections are the Canon C300 / C500 and the Alexa. Yes RED users, you can get your footage to look amazing as well – with some LUT’s and / or a decent amount of post grading – assuming you have a powerful computer to process it. But the BM4K looks pretty darn good right off the card – just like the Alexa. • Color and detail is captured very rich and accurately within the properly exposed range. • Workflow from camera to edit is very streamlined when shooting in ProRes. • The non-removable battery is a pain. I snipped the AC power cable and soldered on a JST connector so I could power it off my gimbal batteries. If you aren’t comfortable doing that sort of thing, you would be forced to stop shooting every 30 minutes or so to find a power outlet and plug the camera in for an hour+ to recharge. There are probably other powering options out there at this point as well, such as rechargeable packs with multi-tip plugs, but the LiPO battery solution has worked great for me, so I haven’t looked any further. 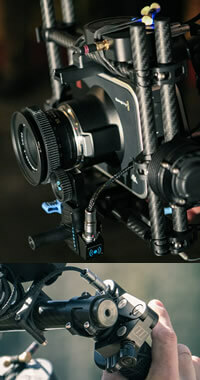 • The AC power plug and SDI output comes out of the side of the camera, making it a very tight squeeze in your gimbal. This is especially true if you’re using a MōVI M5. You may have to use counter-weights / ballast to balance your gimbal correctly, if the cables obstruct your ability to slide the camera front-to-back / left-to-right when attempting to balance it. • Highlights blow into a strange unnatural yellow and eventually a very unnatural purple instead of rolling off to white. Most of the time, simply exposing your shot properly eliminates this issue. But if for example, you’re shooting car footage at nighttime and the camera looks at the headlights, you will immediately see these purple “black holes” in your footage that are a real pain to get rid of in post. • There is fixed pattern noise (FPN) in all of my shots – sometimes it’s noticeable, especially in low light shooting environments, sometimes you can’t see it at all unless you really look for it – but it’s always there. There was a firmware update for the camera not too long ago that was supposed to address the issue, but believe me – the FPN is still there. It gets much worse if you do any post sharpening and using a noise reduction program only seems to improve the issue slightly. However, I have found that if you shoot at 4k and then bring the footage down to 1080p in your edit, the FPN seems to be greatly reduced. Therefore, if your final deliverable is for the web and you don’t have to deliver in 4k, this issue isn’t so bad. But if you were planning on projecting your footage on the big screen, I would have some reservations and certainly do some projector tests before committing to this camera. A good way to consider this issue would be to really critically look at the footage I’ve posted in this article and see for yourself how severe it really is and if it’s something you can live with on your project. • Sort of a continuation from the last point, the camera does not do well in low light. We did an entire shoot in low light to test this very point and it caused me a great deal of pain in post. The native ASA (ISO) is 400 on this camera, don’t even bother pushing it to 800ASA – you will regret it. You can pull maybe 1 stop of exposure from the shadows before seeing too much noise, but beyond that, it gets very messy. A noise reduction program may help a bit, but the trade-off is a decrease in sharpness which is in my opinion a terrible compromise. In our low light shoot, I eventually just accepted the noise after trying tirelessly to minimize it with color grading and noise reduction software. • The RAW post workflow requires some serious computer power. It is also very difficult to match the look of the RAW footage to the ProRes footage shot on the very same camera. Even using the LUT’s built into Resolve, no matter how hard I tried, I could not get the footage to match exactly right. So it’s sort of an all or nothing thing to shoot in RAW. I personally stuck with shooting in ProRes(HQ) on the FILM setting which is essentially the BM4K version of shooting in LOG and that had plenty of latitude for my post color grading. • One small issue we had with my particular camera was that after shooting for about an hour straight, if I turned the camera off and then back on, the camera would not recognize my SSD disk. If I switched the camera mode to shoot in RAW, it would then recognize the SSD and allow me to record, but only in RAW. And this is how I discovered that RAW footage is very difficult if not impossible to match to ProRes footage. As a result I scrapped about half of our footage from one of our shoots because it did not look seamless. Thank goodness this was a test shoot and not for a high paying client! 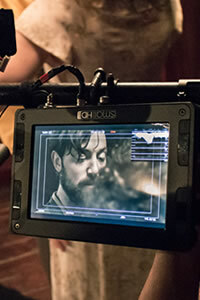 The workaround – do not turn the camera off for your entire shoot, which means hot swapping batteries for the duration. Or if the camera does get turned off, it seems like after about an hour, it will start to recognize your SSD’s again. Did I mention this camera costs under $3,000??? For all the downsides of this camera, I think it is very important to remember that with some thoughtful shooting and adequate lighting, you are able to capture images on this camera that are simply amazing – leaps and bounds better than any DSLR footage that I’ve ever seen and at 4K. If you want to shoot 4K and you have a lot of money to spend, by all means go for the Canon C500 with an off board recorder, a RED Dragon, or a Sony F55. But at the $3,000 price range, nothing comes close to the image quality and performance of this camera. Disclaimer: These camera tests were shot for the most part on the fly, with little pre-production, with no budget, for the sole purpose of testing the camera. While we’ve attempted to edit them into something “watchable”, they are by no means intended to be fully produced stand-alone pieces. 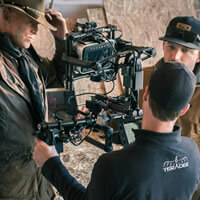 PURPOSE OF TEST: For this test, we brought in a professional gaffer, Casey Schmidt, to help us properly light the scene as we would on a feature film. We wanted to see how the camera performed in a highly controlled lighting situation before pushing it in our other tests, as well as look into the dark shadowy areas. POSITIVES: It looks like film! We were very pleasantly surprised at how well the image emulated film stock, even before post color grading. We were referencing the original “Back to the Future” film for this shoot and it was much easier than we thought to get in the ballpark. NEGATIVES: There were a few iconic shots we wanted to get where the Delorean’s taillights and headlights turn on and sort of wash out the image with flares and light. Unfortunately, pushing the highlights too far out of the camera’s dynamic range cause the “black hole sun” effect in the pushed highlights, which looked pretty bad. We realized this would be easy to fix in post, but it was still an annoyance. My friends at Blackmagic told me there is a post software fix for this built into an upcoming version of DaVinci Resolve which makes this issue a little easier to deal with. The FPN (fixed pattern noise) was also a bit of an issue on this shoot, since we were keeping a lot of shadows in the shot. This is unfortunately simply unavoidable with this camera at this time, as discussed above. PURPOSE OF TEST: For this test, we wanted to do the opposite of the first “Seattle Time Machine” test. Instead of adding light and looking into the shadows, we wanted a bright environment where we could cut out light and look into the overexposed highlights. We also wanted to see how the camera would hold up in a dusty environment, as well as do some fast moving shots out of a pickup truck to look for any sort of rolling shutter effect which of course, shouldn’t exist since the camera has a global shutter. POSITIVES: Similar to our first test, the areas that were in the “sweet spot” of the camera’s dynamic range looked very film-like and cinematic. The environment was extremely dusty which did not aversely affect the camera at all. No rolling shutter when shooting out of the back of a pickup truck. NEGATIVES: As the highlights peak out of the camera’s dynamic range, the color starts to move towards an somewhat unnatural yellow tint. This wasn’t a huge problem on this shoot since we were doing some highly stylized color grading in post, but it was definitely noticeable in the footage where bright areas were prevalent in the shot. PURPOSE OF TEST: How much dirt and grime can the camera take? 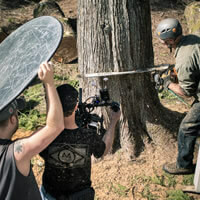 We put this to the test, as our subjects sawed through trees and send sticky, tiny wood particles everywhere. The cleanup afterwards was not a fun chore, but worth the experiment. POSITIVES: The extremely dirty environment did not see to affect the camera negatively in any way. NEGATIVES: Beyond the issue mentioned above – overexposed highlights moving towards yellow – there were no additional issues that arose from this shoot. PURPOSE OF TEST: For this shoot, we got our good friend / actor / fly fisher Jim Burgess to do a little fly fishing on the Skykomish River during golden hour. Our tests were based around: Reflective highlights off water – how far can we push them? Fast moving, small objects – how much detail will register? POSITIVES: As mentioned, overexposed highlights become a bit discolored, but we found that because the reflective light off water has a manipulated stylized look anyways, it actually looked very natural on the camera. We were extremely pleased with how well the camera picked up the small details of the fishing line whipping through the air, throwing tiny droplets of water all over. NEGATIVES: This shoot was one of the most positive experiences we had with the camera, with no negative issues to speak of. 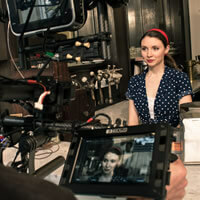 PURPOSE OF TEST: This shoot was all about shooting in low light, using mostly practicals in a small, dark pub. We added one Arri 650 light to bring up the ambient light, but that was all we could really squeeze into the room, which had low ceilings and little space to spare for any sort of additional light rigging. POSITIVES: Where the room was reasonably exposed, the camera did a great job of picking up details around the room and giving the piece a cozy, warm look and feel. NEGATIVES: The room was overall underexposed by about two stops for the lenses we were using and the native ASA of the camera. I boosted the ASA up to 800 (native is 400) and the FPN really showed up badly as a result. 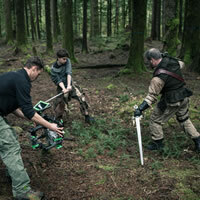 The footage was very noisy and there wasn’t a lot we could do about it which was extremely frustrating. I attempted to use NR (noise reduction) filters in post, but this gave the footage the tell-tale NR plasticy look the more I added. When I added some sharpening to counter the blur of the NR, the FPN popped out even more. In the end, I removed all the NR and sharpening, as the noise looked more appealing than the artificial look of the NR and sharpening. Of all the shoots, this was the one where the camera really suffered the most. I had to constantly repeat the phrase in my head “it’s a 4k camera for under $3k” to feel better about the results we were getting. PURPOSE OF TEST: Similar to the first shoot “Seattle Time Machine”, we brought some lights into a small space and lit it similar to the way we would light a professional set. However, we by no means had an ideal lighting setup due to our “no budget” restraints. 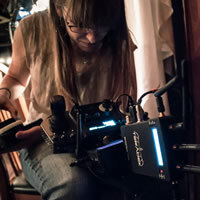 Our Arri 650 lights we had on-hand had less than perfect diffusion and were a bit sourcey. We figured this was actually a very good “indie shooter” sort of test, since this scenario comes up a lot of low budget shoots, so we proceeded anyways. Style-wise, we wanted to achieve a “Pleasantville” sort of look, where colors would be over-saturated and reminiscent of Hollywood films of the 50’s. POSITIVES: Wow, the colors really pop off the screen with adequate lighting on this camera! The contrast between colors was great, colors looked accurate, even when pushed a bit in the post color grade. NEGATIVES: Our sourcey lighting issue really showed up in post. The roll-off from properly exposed highlights to over-exposed highlights is not so smooth once they go beyond one or two stops, so especially on close-up shots, you can almost see a circle of color change where the highlights start turning to the unnatural yellow I’ve mentioned a few times above. Since the color shift is not a natural change of color, but an issue in the camera, it is not an easy thing to adjust in post color grading. We scrapped many shots as a result. Also, on this shoot, for some reason the camera stopped recognizing our SSD cards after about 3 hours of shooting. We found that if we switched the camera to shoot in RAW, it would then recognize the SSD cards, but would only allow us to shoot in RAW, and not in the ProRes HQ format we shot the first 3 hours in. We proceeded to shoot the rest of our footage in RAW, assuming we could apply a LUT in DaVinci Resolve to match the footage to the ProRes LOG footage we had already shot. This was absolutely not the case and it was near impossible to match the RAW footage to our ProResHQ LOG footage. This was extremely frustrating and we ended up not using any of the RAW footage we shot. This is also why out of all the vignettes we shot for this project, this one is the least complete feeling in the edit. Hopefully, Blackmagic Designs addresses this issue and fixes it in a firmware update in the future. Of all the issues we experienced on these shoots, this is the only one I would truly consider a “show stopper”, as on any non-test shoot, you simply would not be able to proceed with shooting if you know the footage is not going to match up in post. Fortunately, we found that after the camera is turned off for about an hour, it starts reading the SSD cards in ProResHQ mode again. But the issue certainly made me nervous on the rest of our shoots, causing me to not want to turn the camera off or change SSD cards if I could possibly avoid it. PURPOSE OF TEST: For this test, we wanted to shoot fast moving subjects and play with back lighting our scene for a silhouetted look. We used the classic 80’s film “Flashdance” as our inspiration and went 80’s all the way with costuming, props, color grading, and of course ending on a freeze frame. POSITIVES: We were very impressed with the camera’s ability to capture a nice silhouette look when the scene was backlit by natural light coming through massive windows at our location. Colors looked great, motion was smooth with no rolling shutter or jello effect (as to be expected with a global shutter). NEGATIVES: The only issue on this shoot was the “black hole sun” effect we got when looking directly into our two Arri 650’s we used to raise the ambient light levels of the room. Since we didn’t want to really see the lights in the scene anyways, we really minimized how often the camera looked in the direction of the lights, so it wasn’t a huge issue. 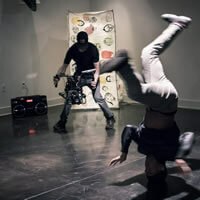 PURPOSE OF TEST: We brought in the award winning breakdance crew “Them Team” to test more low light shooting, with one contrasty hard spotlight in the middle of the frame. POSITIVES: Since for this shoot, we didn’t need to see any detail in the shadows, we were fine with keeping the light on the outskirts of our main center spotlight sort of low and underexposed. We mainly concerned ourselves with lighting the center of the room, where our dancers were supposed to stay while they performed. When they did stay in the center of the light, the camera performed very well and we were please with the results. NEGATIVES: Despite our plan to keep the dancers in the center of the room, these guys needed a bit more space to work, so they strayed from the center light a lot. The only way to see them in the shadows was to push the exposure a bit in post, which brought the FPN up a bit. We minimized the shots we did this on as much as possible though and it wasn’t too much of an issue in our edit. PURPOSE OF TEST: Since our team calls Seattle home, we figured we had to shoot at least one of these vignettes in rainy weather and this was that shoot. 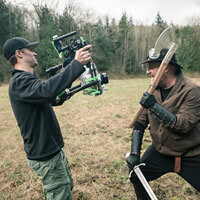 We brought a team of stunt sword fighters out to Index, WA with legendary stunt coordinator Bob Macdougall and let swords fly. We also wanted to see how the camera performs with a low shutter angle setting to get that classic frenetic fight look you see in so many fight scenes in films today. POSITIVES: Rain makes everything look cool in the woods and the Blackmagic 4k camera picked up all the rich, vibrant colors of the rainy woods we had hoped for. We did our best to prep the camera and gear for the rainy conditions, which meant wrapping the whole thing in plastic wrap. This caused the camera to heat up a bit and any water that does get in there becomes condensation very quickly, which means the likelihood of moisture getting into the camera is greatly increased as a result. However, we had no issues with the camera functioning properly on this shoot. NEGATIVES: We closed the shutter angle down to 120 on the camera in order to get a more sharp, frenetic look for the fight scenes. This looked great in the close up shots, but in the wider shots, the background seems to “skip” a bit, which looks a little strange. it wasn’t nearly as bad when we brought the shutter angle up to 144 and higher, but then of course the effect is greatly reduced.